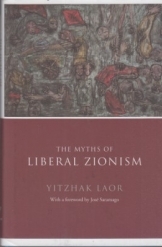 The Myths of Liberal Zionism by Yitzhak Laor and a foreword by Jose Saramago, 162 pages, new book. In this book Laor strips bare the hypocrisies and fantasies that underlie the Israeli desire to be accepted as part of the West along with the growth of Islamophobia throughout Europe. The author has stated that he opposes Zionism and that we have to get rid of it.